The Ogoni people and their land represent oppression and resistance. They are persecuted by their own government for their struggle for human rights and respect for the environment. They are up against the Nigerian government and military, as well as the international fossil fuel Giant Royal Dutch Shell. Despite producing an average daily output of 185,000 barrels of crude oil, Ogoniland remains in poverty. The environment is turning into a wasteland and objections are hit down upon with severe violence. Since 1993, over 4,000 Ogonis have been killed due to state sponsored terrorism. Over 4,000 Ogonis have been killed since 1993 in state sponsored terrorism and quite regrettably, no one has been prosecuted, punished or indicted in the Ogoni saga. Ogoni is a victim of Nigeria's discrimination through laws that are not only unfair but tacitly approves Ogoni persecution and killings without questioning. In 1995, nine Ogonis including Ken Saro-Wiwa were hanged by the Nigerian government for seeking to speak for the people. They had no right to appeal the judgment of a military tribunal that sentenced them to death. Saro-Wiwa led the Ogoni people in a mass-based struggle that highlighted the inhuman activities of the Nigerian state and Shell Petroleum, a subsidiary of Royal Dutch Shell, and sought to compel the government and Shell to respect Ogoni rights to a dignified life and self determination as a distinct ethnic group in Nigeria. In response, the government killed Saro-Wiwa and eight other Ogonis on November 10, 1995. Their hope and expectations were that Saro-Wiwa's hanging will silence the Ogoni people and send signals to the rest of Nigeria's Niger Delta about what awaits anyone who raises questions about the unfair and inhuman distribution of the wealth of the people of the Niger Delta. Saro-Wiwa had been propelled by the denigrating poverty of the Ogoni people who live on a richly endowed land. Despite producing an average daily output of 185,000 barrels of crude oil, Ogoniland has been turned into a wasteland. The crimes of Shell against the Ogoni people has never been questioned by the Nigerian government. Shell has instead continued to maneuver its way using the Nigerian military to force in Ogoniland but never committed to doing the right thing. The oil and huge gas reserves of Ogoniland appear to be unveiling the inhumanity of this very brutish company we call Shell as they desperately push for these resources without concerns for human rights and the safety of the people. consequences of oil exploitation. Consequently, oil revenue from Ogoniland which as at 1990 stood in excess of $100billion has built large Nigerian cities like Lagos, Abuja, Kano, Enugu but the Ogoni people are left in despair. Today in Ogoniland, casket production has become the fastest growing business as death rate is ever increasing. In Gokana local government alone, the coastal communities of Bodo, K-Dere, Gbe, Mogho, Kpor, Bomu, B-Dere record over 50 deaths every week. Strange sicknesses and massive deaths has become the fate of the Ogoni people whose oil revenue make Nigeria a mighty nation and a regional power. The situation is worsened by the lack of basic amenities that should support healthy living like water, hospitals, schools, electricity and even police security. It appears it is a state policy to kill the entire people of Ogoni. The cleanup of Ogoniland which should provide some succor is becoming a scam. While the leadership of the Hydro Carbon Pollution Remediation Project (HYPREP) the government agency responsible for managing the cleanup, is desperately trying to award contracts ahead of the 2019 elections, there is absolutely no infrastructure to support the implementation of the UNEP report. The Integrated Soil Management Center (ISMC) which should handle the massive wastes from the cleanup sites is not in place. The Center for Excellence which should be a training facility is also not in place. All of these infrastructures had been recommended in the UNEP report. None of these are in place, rather, HYPREP is curious about spending the cleanup funds as elections approach. All these place Ogoni in the most disadvantaged position. The solution to all these lies in Ogoni freedom from Nigeria's discrimination. And as the Ogoni Bill of Rights puts it: "the Ogoni people want to control their own affairs. In a nutshell, Ogoni want freedom. Freedom from oppressive and discriminatory Nigerian laws. 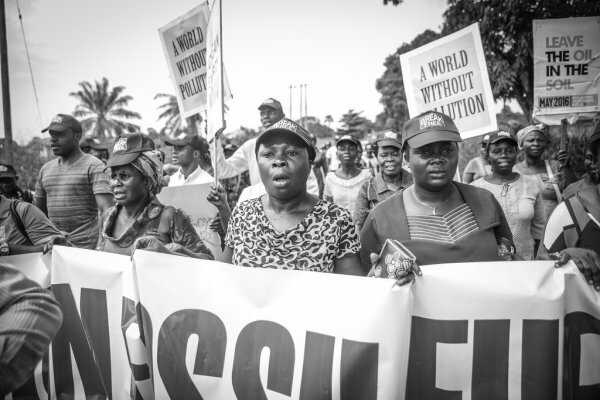 Freedom from Shell's ecological war that sends over 200 Ogonis to untimely graves every week. Freedom to determine our own future and to set our priorities. Freedom to function within Nigeria as Ogoni people. I will urge the world to tell the Nigerian people and government that the Ogoni people want freedom. Freedom to exercise our political rights to self determination. This is a fundamental demand of the Ogoni people, clearly stated in the Ogoni Bill of Rights and we will not compromise on this. I am confident that this freedom for the Ogoni people is near and no one can deny us this right for it is justifiable, it agrees with the aspirations of the founding fathers of our country, it is in agreement with universal Norms on the rights of indigenous peoples and it conforms with the United Nations Universal Declaration of Human Rights. The Ogoni people want to control their own affairs. This is the fundamental demand of the Ogoni people and the basis upon which the Ogoni question can be resolved. Freedom is all we want.